Eintracht Frankfurt have confirmed they are interested in signing Ghana international midfielder Kevin-Prince Boateng following his hasty exit from Spanish side Las Palmas. "I can confirm we are busy with the name Kevin-Prince Boateng and are working on it," said Frankfurt coach Niko Kovac, 45, who played alongside Boateng at Hertha Berlin more than 10 years ago. Frankfurt are hunting for a replacement for Mexican attacking midfielder Marco Fabian, who is out for two months with a back injury. "We have lost Fabian and we're looking what is on the market," added Kovac. "I know Boateng, you just have to look at where he has played for the last few years. "There is no need to talk about his footballing qualities." 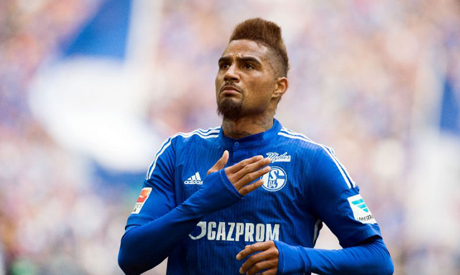 Berlin-born Boateng, 30, has played for top level European clubs Hertha Berlin, Tottenham Hotspur, Borussia Dortmund, Portsmouth, AC Milan and Schalke 04 during his career. Despite having signed a contract extension with Las Palmas at the end of last season, Boateng suddenly quit the Gran Canaria team due to personal reasons on Wednesday. "I have taken the decision as a father and a husband, not as a player," he said in a press conference. Boateng's partner and son live in Milan, while he has another child from a previous relationship in Duesseldorf, which is around 250km (155 miles) from Frankfurt. Kovac brushed off any concerns that Boateng comes with a bad-boy reputation, having been suspended at Schalke in 2015 for his 'disruptive' influence. Boateng was also sent home from the 2014 World Cup by Ghana after a fall out with the Black Stars' management and has a history of knee problems. "Unfortunately, too many people judge people they don't even know -- I know him," said Kovac. On Boateng's fitness, Kovac added: "Kevin played 28 games last season, therefore he is a player who will, and can, put in 25,30 games in a season."